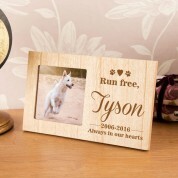 Our beautiful rustic frame is the perfect place to display a cherished photo of a much loved pet. 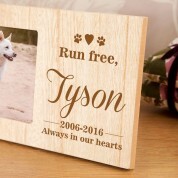 The frame shows a simple design which reads “Run Free”, followed by the pets name in a scripted font. Special dates are included below. Display the memorial frame on the mantelpiece or somewhere that you can see it every day, to remember a special dog. The rustic wood effect frame will compliment any décor and will look stunning wherever it sits in the home. Our professionals work in house to carefully engrave onto the wood for unique results every time. The frame features a small square photo window - perfect for an Instagram snap.